Here is a simple tool, created using this API. Click on the marker, the Latitude and Longitude position will be displayed in a window and also in the textbox. If you set a Latitude, Longitude point in the textbox and click on the button, that point will be shown in the map with a marker. Now I'm going to show you, how you can make this tool.. The DIV element with id 'map_canvas' will be the container of the Map. This id will be required when you create the map object to display in this div. Set the window onLoad callback method and in that method, call the LoadMap method with initial latitude,longitude. For the information window first create the content of the window then create a InfoWindow object using the content. This object will be later used in the onClick event of the Marker. Now create the Marker object using the LatLng and Map object. Finally add an event listener for the Marker object. First open the InfoWindow object then call the method which set LatLng value to the textbox. Geochart can be a handy tool if you want to represent the demographic behavior of your service. In my recent project for Bangladesh Post Office I used this tool to represent the usage of their service in each Division of Bangladesh. Another big example is the Google Analytics where you can view the location based visitor information of your site. Here I am going to show you how you can use this in your project. Now create a DIV element and give it an ID. This id will be required when you create the chart object to display in this div. In the callback method first create a DataTable object add two columns. Just give a suitable name as per your requirement. Now set some value to the DataTable. The first column can be an Address, country name, region name locations, or US metropolitan area codes. For country and region name follow this ISO-3166 code or text equivalent to the code. The second column will be the value of the area. Finally configure some property of the chart and draw it using the data previously set. You can load the chart data by a webservice call. For C# see my previous blog. Visit this link to know more about Geochart. If you want to load a chart asynchronously in C# . NET, Google Chart Tools will be the perfect choice for you. It is easy to use and enough flexible to customize. 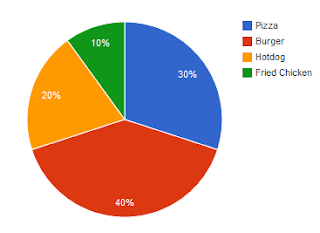 Suppose you want to show how many students in your class like Pizza, Burger, Hotdog, and Fried Chicken in a Pie chart. Here I will show you how to load the students' data from server side using WebService and show it in a chart asynchronously. Now come to client side code. Create an aspx file named GoogleChartToolTest.aspx and add this line between head tag. Create a DIV element and give it an ID. This id will be required when you create the chart object to display in this div. Also add a ScriptManager to call your webservice method. The result will be like this. Visualize the DataTable as a two dimensional array. It will help you to understand the above code. Here is the Google Chart Gallery. You will get a lot of example there. There are lots of jQuery modal plugin available in the web. For my current project I need one which, I can easily customize. I realized creating a modal by myself is the best way for gaining maximum freedom. It is very simple and easy to use and customizable. You can give it a try. Here I will describe how to use it. First download all the required files from here and include in the page. Create a DIV and give it an id and set the display property 'none'. You can insert any content between the DIV tag. <input type="button" name="name2" value="Show Modal"
Here is an example. Click on the button and a modal will pop up. There are some configurable options for the modal. setModalButtonCss : Set True if you want to display all buttons contained in the modal in a zModal style. hideDefaultClose : Set True if you want to hide the default close button. opacity : You can control the opacity of the background with this parameter. bgColor : You can change the background color with this parameter. Here is an example with all the options are set. <input type="button" name="name" value="Show Modal 1"
I'm sure all of you are frequently using RegularExpressionValidator in your project. But are sure you are not repeating same expression in multiple pages? Is your code impervious to Change? If you are a bit careful while writing code, you can avoid this. And your friend will be 'Inheritance'. If you need this Validator in more than one page, then writing the same code block in every page obviously produces code duplication. Moreover if your project manager asks you to allow '+' at the beginning of the phone number then you have to change the regular expression in all pages. That will be surely a painful task for you. You can make your life easy by following approach. Now it is a matter of seconds to accomplish what your project manager wants. Yesterday I was looking for something new (new widgets, new functionality) in the latest GXT version (2.2.1) and found that, it is now providing grid filtering support. You can add MS Excel like filtering option in your application through this. I think it was the most demanded and expected feature from the GXT developers which can be highly utilized in Enterprise Reporting. I am going to describe how to add this functionality in GXT Grid. Create a new project named GxtFilterGrid and add GXT library in the project. As like my previous blogs about GXT Grid I have used the same Employee model and TestData class for generating data. You will find the code of these classes here. Go to the onModuleLoad method of GxtFilterGrid class and remove all the auto generated code of this method. First create a list of ColumnConfig and a ColumnModel from this list. Now create different types of filters like Numeric, String, Date, etc. Constructor of these filter classes takes the column name to bind the specific filter with a specific column. You can also add a ListStore as a filtering option with the help of ListFilter. For adding a list filter, create a ListStore of ModelData or your own BaseModel class and add this as the source of ListFilter. Display Property of the ListFilter will be the key name of your model data. Now create a GridFilters instance and add all the filters created above with this instance. Finally create a ListStore of Employee Model and, a Grid from this ListStore and ColumnModel. Add the GridFilters instance as the Plugin of the Grid. Here is the code of department method which is used previously. Few days ago I did some image manipulation tasks like resizing, cropping, etc. java awt provides some useful functionality to do this type of tasks. Here I am going to share how I accomplish the tasks and finally and ImageUtility Class which you can use in your project. First read the image with the ImageIO which returns a BufferedImage. Then create another BufferedImage instance with the new width, height and image type. Now get the Graphics2D component of the new scaled image and draw it. If you want to preserve the image quality, add following line of code before disposing the graphics component. It's simple, is not it? Read the image with ImageIO as stated previously and get the sub image of the original image. First two parameter of the getSubimage method is the x,y coordinate, from where you want to begin cropping. Sometimes you need this specially when you want to save an image in database in blob data type . We can get byte of an image with the help of ByteArrayOutputStream and ImageIO class. All the above actions can be encapsulated into a simple ImageUtility class.